Katsuhiro Otomo produced work in the cyberpunk mode long before the 1988 animated adaptation of Akira made him a global icon of the sf genre. He began the Akira manga in 1982 and wrote and directed the segment “Construction Cancellation Order” in the 1987 anthology Neo-Tokyo. Shortly after Akira, he also wrote the screenplay for Roujin Z (1991). But before any of these, there was the manga Domu (1980-1983). Domu is the story of the residents of the Tsutsumi public housing complex. They have been terrorized by a series of suicides as grisly as they are mysterious. Two policemen, Takayama and Yamagawa, search helplessly for any shred of evidence explaining the bizarre deaths, but it is not until the arrival of a young girl named Etsuko that the investigators turn their attention to Old Cho—a senile man who conceals immense psychic powers beneath a harmless exterior. Etsuko herself is a gifted psychic, and the climax pits Old Cho against Etsuko in an epic battle for Tsutsumi and its residents. While Domu is often described as sf-tinged horror, in this essay I argue for the manga’s inclusion in Otomo’s cyberpunk oeuvre due to four main parameters. First, Domu shares key stylistic elements with cyberpunk texts. Second, the manga examines the postmodern condition, simultaneously representing, satirizing, and critiquing neoliberal society—participating in what may be the defining political project of cyberpunk. Third, Domu tracks how neoliberalism predominantly affect the lower class, the “punk” in cyberpunk. Finally, though the text takes place in the “contemporary” of the 1980s and therefore lacks cybernetics or advanced computing, the image of Old Cho reflects a radical shift in conceptions the body. Therefore, as with most cyberpunk texts, the posthuman body is a key image in Domu. For a postmodern genre like cyberpunk, style is substance and so subtle stylistic elements Domu shares with other cyberpunk texts are worth noting. One of the initial stylistic markers of cyberpunk is what Andrew Butler calls a “linguistic and stylistic density” (15). In literature, this tends to result in a spare narration style crammed with jargon that overwhelms untrained readers, while in visual arts, the effect is achieved by an overload of visual detail. Unlike many manga artists whose styles are pared down to cartoony lines,1 Otomo’s style is unusually detailed, especially his backgrounds. He tends to use many panels per page, resulting in pages jam-packed with information. Another stylistic element of cyberpunk evident in Domu is the influence of the hard-boiled novels and noir films (Cavallaro 8). Domu plays out like a hard-boiled whodunit, right down to the morally ambiguous ending. Likewise, Domu shares aesthetic qualities with film noir, such as high-contrast mise-en-scene, chiaroscuro lighting, extreme angle shots, and asymmetrical composition. Otomo regularly uses these techniques to highlight emotional effects and represent disorientation. Likewise, Otomo skillfully uses saturated blacks against bright whites to create high-contrast scenes. Perhaps the closest connections between film noir and cyberpunk is setting: neither could exist without the city. Domu takes place almost entirely within the limits of the Tsutsumi housing projects. Though not the glittering neon of downtown, it is space deeply affected by the alienation of rapidly expanding urbanization. Cyberpunk is often briefly defined as “high tech, low life”—the latter expressing the “punk” in cyberpunk. The genre is urban, gritty, and, well, punk, a movement Dani Cavallaro argues, “constructed a whole aesthetic out of a reality of socioeconomic alienation and discrimination” (20). Cyberpunk texts reflect this aesthetic with a “surreal setting of urban brutality, deprived of any real sense of belonging” (9). In Domu, this lack of belonging is embodied by Tsutsumi. Though not quite as disreputable as America’s inner city projects, danchi like Tsutsumi are associated entrappedness and alienation. When discussing his inspirations for writing Domu, Otomo recalls visiting a complex like Tsutsumi. He said its residents “never seemed to adapt to this sort of crowded urban living, but they found themselves trapped in that world” (234). Otomo reflects this alienation by peopling Tsutsumi with a cast of extreme outsiders and outcasts: Little Yo, a large but mentally underdeveloped man wrongly accused of child molestation; Mrs. Tezuka, a woman whose miscarriage led to a nervous breakdown; Yoshikawa, an alcoholic, abusive single father; and antagonist Old Cho, a senile man abandoned by his family. Tsutsumi is technically a home, but acts as an un-home—the place its residents are least safe—produced by the transformations of capital and space under neoliberalism. In Globalization and Culture, John Tomlinson defines “deterritorialization” as the way neoliberalism “fundamentally transforms the relationship between the places we inhabit and our cultural practices, experiences, and identities” (106). In other words, it is a “disembedding” of persons from place (Tomlinson 107) that, in Otomo’s Domu, becomes the basis for making cyberpunk horror out of neoliberalism’s effects on urban Japan. To highlight this, Otomo draws characters in public, depersonalized places: playgrounds, courtyards, hallways, elevators. There is only one scene of a bedroom, and it portrays an invasion—Old Cho stalking a victim. One particular scene displays the horror of deterritorialization to full effect. As the scene begins, Etsuko leaves her family’s apartment. Having been sent on an errand, Etsuko heads to the elevator. The elevator stops early and creaks open to reveal the face of Tsutomu Sasaki, a failed college student. Currently possessed Old Cho, Tsutomu’s eyes are blank, his face expressionless. Within a few panels, Otomo’s drawings reveal Tsutomu is only wearing socks. In Japanese society, the removal of shoes is an almost universal, cultural ritual that creates a separation between the sacred space of the home and the world outside. In fact, as Etsuko leaves her apartment Otomo draws her putting on her shoes. Tsutomu’s stocking feet highlight his disconnection from his environment. As Tsutomu lunges to attack Etsuko, the panels cross cut to Old Cho, cackling, and back to Tsutomu as he slices his own neck. As Tsutomu’s gore-covered body lunges toward Etsuko, Otomo cuts to another scene and leaves the attack up to the imagination of the reader. With this choice, Cho’s possession gains a kind of viral power: Etsuko’s pain and horror is a product of our minds and imagination. Cho is now “untied” from time and space, his murders happening again with each new reader, making us complicit in his crime. Thus untethered from time and space, he can terrorize us, as well. Still, it’s hard to imagine cyberpunk without “cyber”—the “high tech” in “high tech, low life.” While there are no androids or console cowboys, Domu does address issues of cybernetics and cyborg theory. For while it is closely associated with computers, cybernetics can also be understood as a form of virtuality (Hayles 13-14), in which the body itself is reimagined “as an electronic system” which acts like “a communications network capable of absorbing information through the senses and of subsequent action upon the information received” (Cavallaro 12). This post-human conception of the body aligns with Donna Haraway’s conception of the cyborg, in which is not necessarily a combination of human and machine but instead any image and metaphor that blurs the binaries between human and non-human, living and non-living, organic and non-organic. Though it may be psychic and not electronic, Old Cho does creates a communication network with psychic powers, as my reading above attempts to show. This network is established through Cho’s fetishistic trinkets and toys, as well as the people he possesses. While not a mechanical arm or mirrorshades, the image of Old Cho and his toys is a kind of cyborg body that enables him to act in ways he seems incapable in the daylight. On his own, he is silent and meek. With his trinkets, his psychic power is amplified, his physical body no longer at issue. Thus, his trinkets are a pathway into posthumanity. This is part and parcel with Sherryl Vint’s understanding of cyberpunk as an appeal “to the (impossible) desire to escape the vicissitudes of the body and occupy the place of self-mastery” (104). Vint locates this specifically as an adolescent desire, but Otomo draws it in connection with a character who once had such power but not longer does. Where Domu aligns itself with cyberpunk most clearly in its critique of neoliberalism, which Wendy Brown describes as a culture that “normatively constructs and interpellates individuals as entrepreneurial actors in every sphere of life,” resulting in a society that “configures morality entirely as a matter of rational deliberation about costs, benefits, and consequences” (15). This is perhaps the greatest overlap between Domu and cyberpunk, a genre Fredric Jameson called “the supreme literary expression if not of postmodernism, then of late capitalism itself” (419). Old Cho is a monster created by neoliberal logic run amok. Though insane, his actions have a cold rationality: when Cho wants something, he gets it. His existence is defined by conspicuous consumption; his identity is wrapped up in the toys he covets. His interests may seem banal, but they nonetheless drive him; his whole existence has boiled down to a “series of market relations” (Macpherson 264). The only times he interacts with another individual is when he wants something from that person. When others approach him during the day, he seems completely dissociated. The first time we meet him, he sits mutely on a bench, smiling with his eyes closed. People sit beside him and leave; yet he remains hunched over his cane, more prop than major character. Near the end of the book, Cho is brought to the police station for a psychiatric evaluation; he sits at the table, his attention solely focused on his toy car. He only responds when someone brings him candy, and then he stuffs the sweets into his mouth before the aide gets a chance to remove the wrappers. Unfortunately, no one in the complex but Etsuko acknowledged the danger Cho represented to their community before it was too late. The consequences of globalization—embodied both in Cho’s neoliberal logic and the deterritorialization felt by Tsutsumi’s residents—plays out in Domu’s troubling conclusion. Without verifiable evidence of his crimes, Cho is released back to the complex. Annoyed by the decision, a suspicious detective requests to be detailed to Tsutsumi to watch Cho. One afternoon, Cho naps on his usual bench, but his relaxed smile turns into horror as Etsuko walks into the playground. In an image both inspiring and chilling, the children of Tsutsumi join Etsuko in a final confrontation with Cho. Powerless against the children’s combined force, Cho dies while Takayama, confused and afraid, watches in dismay. Etsuko’s murder of Cho removes the specter of a capitalist gone wild, and brings some stability to the troubled neighborhood; yet in order to do so, children (those almost universal symbols of innocence) must become like Cho to protect their property. It could be argued they are at some level forced to kill Cho, but it is no less disturbing to see Etsuko’s determined posture juxtaposed with Cho’s death stare. A few nights before, Etsuko wept hysterically and called for her mother while protecting the complex, yet in the ending, she is calm and cold while she kills Cho. The encounter with neoliberalism has changed her forever. 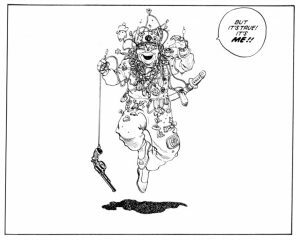 Otomo’s ambiguous ending denies any easy or straightforward way to confront the global saturation of neoliberalism, and certainly doesn’t “defeat” it. Though Cho dies, there is no indication that the complex’s other issues—deterritorialization, alienation, changing notions of family and community—have been resolved. The ambiguity of Domu’s ending lies in the impossibility of the situation: though the effects of global neoliberalism are horrific, the attempt to remove them without dismantling the system itself produces equally undesirable results, repeating the cycle of violence. This conflict haunts Otomo into his later work, the more obviously cyberpunk Akira, where the victims of an apocalypse turn their angst into a second apocalypse, and the naiveté of psychic children destroys an over-industrialized Tokyo. Twice. Bio: Andréa Gilroy earned her Ph.D. in Comparative Literature at the University of Oregon in 2015. She is the Fundraising Coordinator for the International Comics Arts Forum and is associate curator for the exhibit Marvel: Universe of Super Heroes, currently on display at the Museum of Popular Culture in Seattle. It is not uncommon for artists to have simplified figures but detailed backgrounds. Even Otomo takes part in this to a certain extent, though his backgrounds are hyper-detailed, and his figures are more detailed than many of his peers. Arnason, Johann P. and Yoshio Sugimoto. Japanese Encounters with Postmodernity. London: Kegan Paul Intl., 1995. Clammer, John. Contemporary Urban Japan: A Sociology of Consumption, Oxford: Blackwell P, 1997. Haraway, Donna. “Haraway_CyborgManifesto.html” “A Cyborg Manifesto: Science, Technology, and Socialist-Feminism in the Late Twentieth Century.” Simians, Cyborgs and Women: The Reinvention of Nature. New York: Routledge, 1991.149-181. 3 Nov 2009. <http://www.stanford.edu/dept/HPS/Haraway/CyborgManifesto.html>. Harvey, David. The Condition of Postmodernity. Cambridge, MA: Blackwell, 1990. Hayles, N. Katherine. How We Became Posthuman: Virtual Bodies in Cybernetics, Literature, and Informatics. Chicago: U Chicago P, 1999. Jameson, Postmodernism, or The Cultural Logic of Late Capitalism (Durham, NC: Duke University Press, 1991), p. 419. Jameson, Frederic. The Geopolitical Aesthetic. Bloomington, IN: Indiana U P, 1995. Lebra, Takie Sugiyama. The Japanese Self in Cultural Logic. Honolulu: U Hawai’i P, 2004. Macpherson, C. B. The Political Theory of Possessive Individualism. Oxford UP: Oxford, 1964. 263-277. Otomo, Katsuhiro. Domu: A Child’s Dream. Trans. Dana Lewis and Toren Smith. Milwaukie, OR: Dark Horse Comics, Inc., 2001. Roberts, Glenda S. “Pinning hopes on angels: reflection from an aging Japan’s urban landscape.” Family and Social Policy in Japan. Ed. Roger Goodman. Cambridge: Cambridge UP, 2002. 54-91. Simmel, Georg. “The Metropolis and Mental Life.” Classic Essays on the Culture of Cities. Ed. Richard Sennett. Trans. H. H. Gerth. Englewood Cliffs, NJ: Prentice Hall, Inc, 1969. 47-60. Tomlinson, John. Globalization and Culture. Chicago: U Chicago P, 1999. Sherryl Vint. Bodies of Tomorrow: Technology, Subjectivity, Science Fiction. U Toronto Press. 2006. Zaretsky, Eli. Capitalism, the Family, and Personal Life. New York: Harper Colophon, 1976.